﻿ Handy Library Manager: self check out, self check in module. Help, how to topics > Add-Ons, Search, Check In/Out, ... > Library borrower self check out. Handy Library Self Check Out and Self Check In. 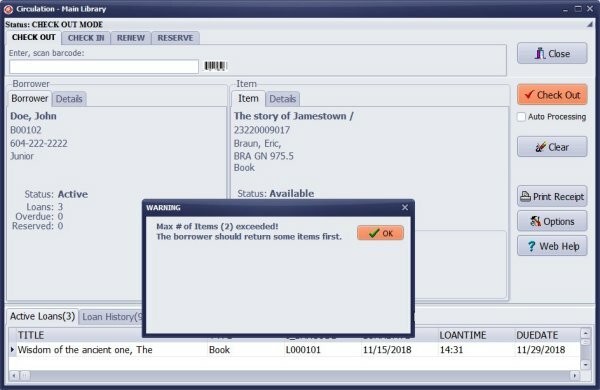 Handy Library Manager comes with several add-ons: Check In/Out, Add Data, Search (Desktop OPAC), Search (Web OPAC), Transfer. Library Add-ons are included in the package (no additional cost is involved). The Check In/Out utility support self processing. 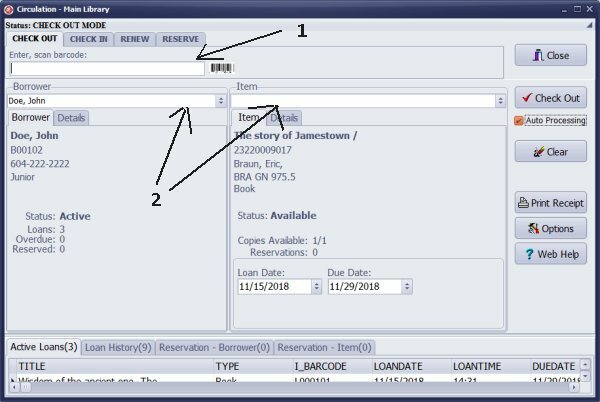 The Library Loan module supports check out, check in, renew, and reserve transactions. Borrowers are not allowed to override loan rules if in Self Check In/Out mode. Borrowers can process check out transactions using barcode scanner and barcode labels (1). 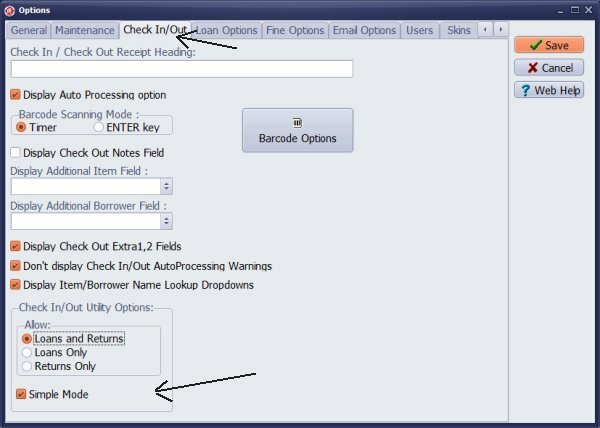 Borrowers can process check out transactions manually using selection boxes (otpional) (2). Set Simple Mode to let borrowers process self check in and out transactions. See how to set library options. More to read: How you can open add-on application? Question: Is there a way to disable the override option for the checkout limit popup? We have our system set up for self-check, but the students are clicking the override option and checking out more than their allowance. Use check in/check out module. In the library main application set Simple Mode in the Options/Check In-Out.